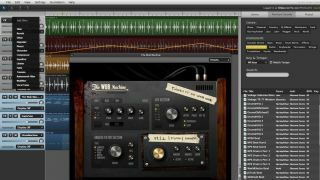 Could Soundation Chrome Studio represent the new gold standard for online DAWs? With its Soundation Studio online DAW, PowerFX has been leading the charge towards browser-based music making for a while now. Now it's released a native version of Soundation for Google Chrome. This comes with a new audio engine and HTML5 interface, but has the same look and feel as the Flash version. What's more, tracks created in the Flash version will open in Soundation Chrome Studio. The Chrome version of Soundation promises very low latency for recording, super-low CPU usage and an extremely stable environment. Chrome Studio also boasts three new effects (including Vocal Tuner), direct drag-n-drop for audio and MIDI files, shortcut key commands and other workflow improvements. "This is a great step in the development for the future of making music online," says PowerFX CEO Bil Bryant. "With Soundation, other than an internet connection, there are no barriers to begin the process of learning and making digital music. It's free and you only pay if you want more sounds or functionality". Soundation Chrome comes with 14 effects, three synths, two drum machines, a GM synth, a sample player and over 700 loops and sound effects. You can export or post and share your creations, and even distribute to Spotify and iTunes directly from the application if you have purchased the Soundation Distribution product. For more information go to the Soundation website, or to start making music directly go straight to the Soundation Chrome Studio.